With monkfish, Maldon oysters and moules marinière on the menu, this is smarter than most chippies. 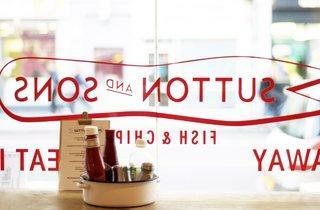 But Sutton & Sons knows on which side its bread is buttered, catering as it does for Stoke Newington foodies. Natural and attentive staff, sustainable fish (from its fishmonger across the road) and locally brewed beer signify a top-notch chip shop. Batter was crisp and not too greasy, and battered monkfish very good indeed, but skate wing a little under-seasoned. 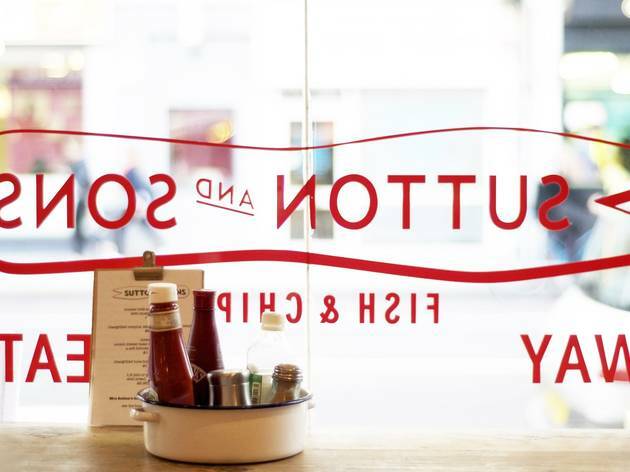 Although you might expect a fancier battered sausage, Sutton’s keeps to tradition where it needs to and dishes up a nice old-fashioned saveloy. Mushy peas were also pretty standard, but the kitchen brings a touch of innovation with its balsamic-pickled baby onions and own-made garlic aïoli. Make sure you get in quick at the weekends if you want a slice of Mrs Sutton’s sticky toffee pudding – it often sells out. 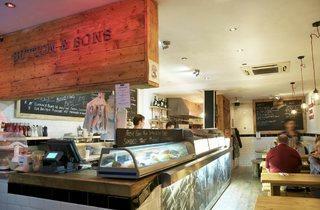 I've moved in the area just under two months ago and Sutton & Sons is the first gem we've discovered. Their fish and chips are simply delicious. Fresh and tasty as possible. My partner usually eats a lot (to be fair to him he is super tall) but he admitted that taking a large fish and chips was a big mistake. The regular ones are more than enough and all this under £8! It is a MUST TRY! My friend encouraged me to try this place. 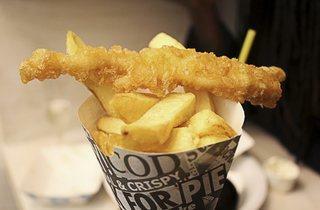 As a northern from Hull I am very fussy with my chip shop and only found one in London I like. However this has finally changed! And prices that are close to my northern land have helped. The batter is lovely, not greasy and perfectly cooked, the fish was good but not much inside each goujon and the chips were perfect. However they forgot the tarter sauce so this did upset me a little as we did a take away. Overall I know I'll be back as I loved it so much but I'd like to see a little more fish in my goujon and I'll double check the tarter sauce but for £10 for two of us on a Friday night well that's a cheap night out isn't it! I Have always adored fish and chips, but I often remove the thick greasy batter and cringe as they microwave the mushy peas in front of me. 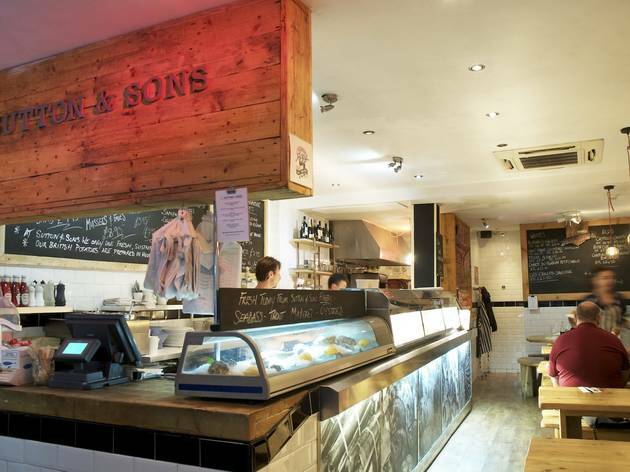 At Sutton & Sons there is an open kitchen and fresh fish on ice displayed, the menu spans to lobster subs and oysters and you can have your fish batterless or with rice flour batter for allergies. There is something charming and old fashioned about the experience, you speak directly to the chefs, wait while your food is freshly cooked and get a takeaway in a paper bag or sit at one of the chunky wooden tables and order a beer. It is absolutely worth the extra couple of quid. The best fish and chips I know! This review is about the Sutton & Sons in Hackney, but I couldn't find a page for that one yet, so.. Bus terminated in Hackney, and whilst waiting for another 254/253, truly enticing smells wafted over from Sutton & Sons across the street. After a long day, could not resist heading over to check out the menu. My friend immediately went for the fish and chips, whilst I held back trying to decide whether or not to splurge on the delicious smelling fried fish with the last of my £5. 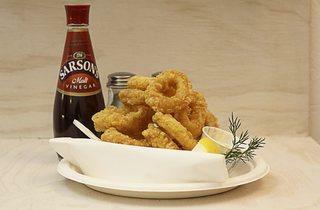 Then the calamari rings for 4 quid caught my eye, so I went for it. And boy, was I not disappointed. The space itself is super cramped and busy, with a few long tables fit into the “dinning space” like tetris. Waiters, deliveroo drivers, hungry folk who can smell it from the street all stuck in together trying to order. If you can get a seat, you’re fine. 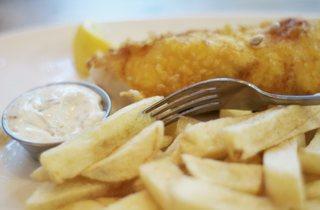 The staff was super friendly - I got a smile with my tartar sauce! And the food is DEVINE. 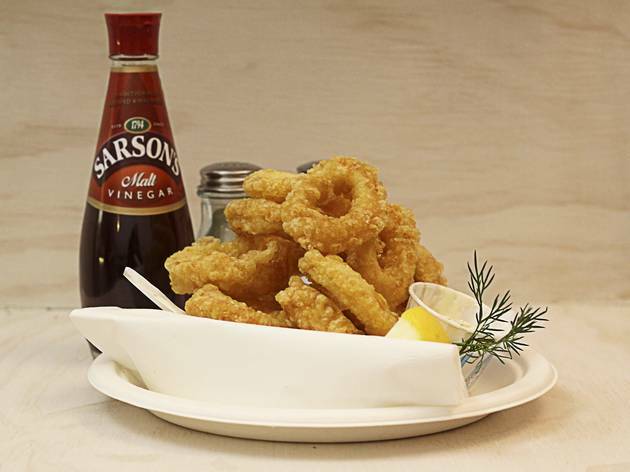 Be it that I’d had a long week but the calamari was so crisp, flavorful and made a wonderful crunch-noise as I ate. Absolutely will be going back, and not just because it’s on my bus route home. It was the worst lunch I had ever had was just like a leftover. And dirty glasses, dirty toilet. Really disgusted over all, had eaten there before it wasn't like this but he told me "it's cold today isn't it" and served me this disgusting meal. Don't know what's wrong with that guy. 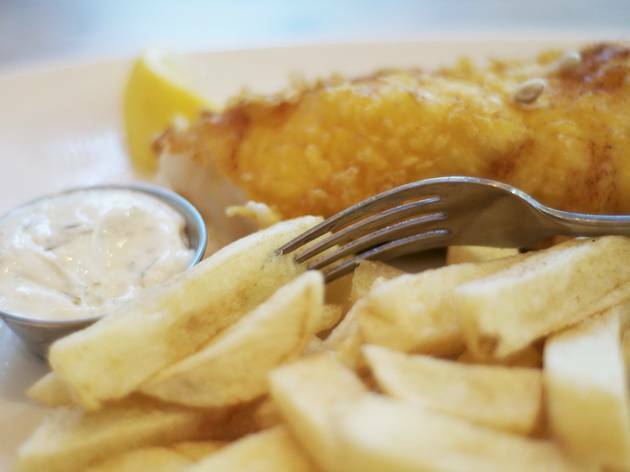 If you've got a craving for fish and chips, this is the place to go. They offer take-out but we chose to sit-in and enjoy our fish and chips with prosecco...because you can do that there. 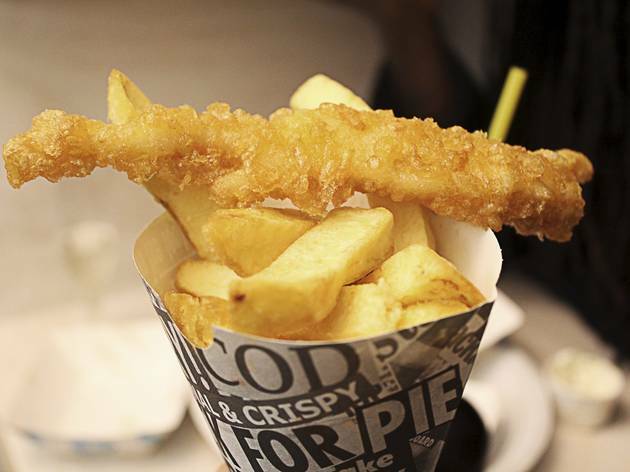 The batter on the fish is light and crispy and the chips are a potato enthusiasts dream! Only the good ingredients go into what's on offer here and so paying a bit above the average is well worth it. Decorated not dissimilar to the apartment in 3 men and a baby and with oysters on the menu, this is definitely your high end chipper. You have the option of eating in or taking out, either way be prepared for a wait on the weekend. The fish and chips are a bit pricey, around £8, but you get your money’s worth and it’s less greasy than your usual chip shop offering. They've now opened a new one in Islington that I popped into a few weekends ago. But rather than going for the typical fish and chips, I went for the grilled seabass, mash and mushy peas instead. It was delicious! Best fish and chips! Great quality, variety and not pretentious. We go there at least once a fortnight. Codburgers are particularly good. Best Fish and Chips in the city! Love it! Favourite place in Stoke Newington, consistently amazing food, charmingly simple place, great staff. Fresh fish, home made chips and local beer, don't miss it. ive been coming here for a while now and it just keeps getting better ! absalotley the best fish and chippy shop. why? becase i was there. My first and unfortunately last encounter with Sutton and sons.The customer service was awful. i received the inorrect order TWICE, when i took my order back a second time i was looked down upon & didnt receive an apology. I have to agree with Philipa, in that their arrogance will see them loose custom. Btw when they finally did get my order correct, the chips were undercooked and cod was average at best. Never Again. The fish was not bad, the chips were not crispy enough, but what killed it for me was the smell. I was there 15 mins, not more. When I arrived home everything from Jacket to t-shirt stank of grease and frying oil. I will not be coming back any time soon.